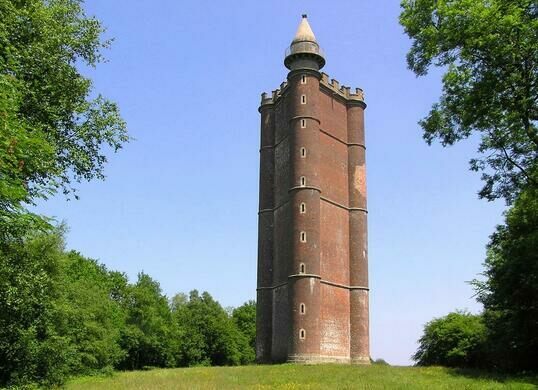 King Alfred’s tower is one of many “follies” built in Britain. Follies are those buildings erected by the upper classes during the heights of British power for the sole purpose of displaying wealth and entertaining friends. This particular folly was built to celebrate a victory by the Saxon, King Alfred, over the Danes in AD 878 and is the legendary site where the King raised his standard prior to the battle. Built by the Hoare banking family, the triangular tower is constructed from over a million red bricks and stands 50 meters in height. 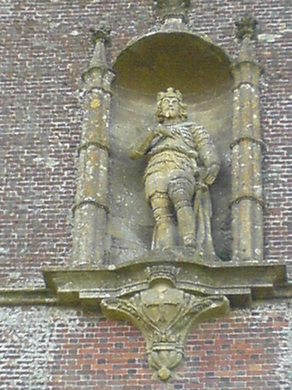 Work on the tower began in 1762 and was completed in 1779 with the addition of a ten-foot-high statue of King Alfred in an alcove above the entrance. This tower was mentioned in a poem by the British poet, Thomas Hardy, in his poem entitled “The Channel Firing” written in 1914. Damage to the tower occurred during World War II when an American plane crashed into it, severely damaging the upper 10 meters of the structure. The turret was repaired in 1986 with a helicopter used to lower the new cone onto the tower. Today visitors can once again climb the stairs to the viewing platform on top.